Starring Robin Williams and John Travolta, Old Dogs is a story about two advertising executives who have made it big in the world of advertising but have sacrificed starting a family. These two best friends are a little like the Old Couple but funny enough, their friendship have survived, even though Charlie (John Travolta) generally uses Dan (Robin Williams) as the bud of all jokes. During a presentation to a group of Japanese executives, Charlie tells the story of how Dan got divorced and in order to get his friend back on track, he took him away for a holiday. Through a wild night of alcohol and hysterics, Dan unwittingly marries Vicki (Kelly Preston). Seven years later and Dan has started correspondence with Vicki and then Vicki plants a doosey on him when they meet up several years later. During their fling we discover that Vicki became pregnant and had twins and as Dan is introduced to his two new children, he soon discovers that Vicki is about to go to prison for 2-weeks as an environmental protestor. Unfortunately, Vicki's friend, a hand model was supposedly to look after her children but is inadvertently injured by Dan when he accidentally slams her hands in the car boot. Now it's up to Dan to man up and because Charlie got him in this predicament, these two long time bachelors must now look after the children. <insert Hollywood comedy clichés here> Believing that two grown men can look after the twins proves more difficult than it is, especially when they are trying to secure a multimillion dollar contract with a Japanese company. With a variety of over the top situations for comedic relief, strangely enough it actually works as Williams and Travolta are a treat to watch, especially Travolta who really lets loose. Williams as a straight man is a little odd which is probably due to the age difference between him and Travolta but the writers definitely use this to their advantage with lots of jokes about grandparents. My favourite part in the film, besides Charlie’s dogs incontinence problem is when the kids mix up the pills for these too old bachelors that causes some hilarious scenes, thanks to some crafty CGI. The conflict of the movie comes quite late in the movie as these two men attempt to “father” themselves. Apart from Williams and Travolta, there’s some great cameos by Matt Dillon and Justin long as red neck scouts and the late and great Bernie Mac who plays a music producer. A special mention should also be made for Seth Green who has a few scene stealing scenes, especially when he is in the arms of a gorilla, singing I’m all out Love. Of course not all scenes are amusing and some are down right embarrassing like when Dan is connected to a puppeteer suit that was just embarrassing. I even cringed and felt myself going red! Even so, Old Guys is definitely a movie for the entire family and on Blu-ray, the video and audio is quite exceptional. 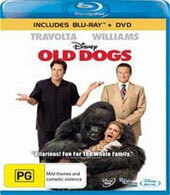 Add in some interesting special features from commentary, deleted scenes, bloopers and music videos and Old Dogs is another decent Disney release. Check it out for the entire family!